Will Pending Policy Changes Help or Hurt US Competitiveness on Energy? Democrat and Republican policy experts discuss how political leaders can enable the U.S. energy sector to keep pace with other nations. 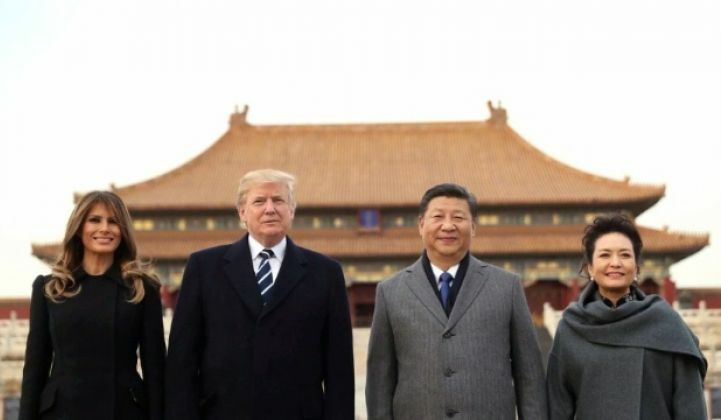 President Trump meets with President Xi Jinping on a trip to China. Significant policy changes are looming for the U.S. clean energy sector -- among them, federal tax reform, new state-level leadership, global trade debates and more. At the same time, a lack of action from the highest levels of government could have just as much influence on how well (or poorly) the U.S. cleantech industry fares in the coming years. On our latest episode of The Green Room -- GTM's live video series on clean energy news and issues, from a bipartisan perspective -- we discuss tax reform, local election results, President Trump's trip to China, pending solar import tariffs and the Department of Energy's proposed rulemaking to support coal and nuclear. Amid all of this we ask: Is the U.S. doing enough to modernize its energy policies to keep pace with other nations and adapt to technology change? Our guests, as always, are Shane Skelton, former energy policy adviser to Paul Ryan and partner at S2C Pacific, and Brandon Hurlbut, former DOE chief of staff under Steven Chu and partner at Boundary Stone Partners. Follow GTM on Facebook to watch The Green Room live and stay up to date on the latest articles.